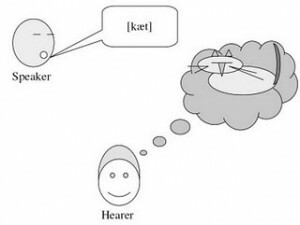 the concept of cognitive construal operations, which are seen as one of the most important aspects involved in language use and understanding. Construal operations refer to the specific ways in which a language can portray events and states of affairs from certain perspectives. They include things like expressing different viewing frames on a situation (e.g. “The train goes from Norwich to Peterborough” static and focusing on the whole journey vs. “The train is going from Norwich to Peterborough” dynamic, and only focussing on part of the journey vs. “); construing things at different levels of granularity (animals vs. mammal vs dog vs pug vs black pug vs Rico), spatial perspective (“e.g. “We are going to your party” with the speaker being the ‘deictic centre’ vs. “I’m coming to your party” with the hearer being the “deictic centre” towards who the movement is directed); degrees of involvement or subjectivity/objectivity in a situation (e.g. “the team are really looking forward to the derby” vs. “me and my mates are really looking forward to the derby”) words to denote different aspects of a situation (e.g. : ‘cost,’ ‘charge,’ ‘spend,’ ‘pay,’ ‘sell,’, ‘buy’ for a commercial transaction), and so forth (cf. Radden & Dirven 2007). How and when did the capacity (or set of capacities) evolve that allowed us to communicate and share our perspective on things and co-construct a joint perspective on topics? From a CL point of view, two things are important here: the specific of construal operations of any invididual language certainly have evolved through cultural transmission (cf. Heine & Kuteva 2007; Christiansen & Chater 2008; Kirby 2012, see also here). But all construal operations are thought to be instantiations of and to rely on general cognitive capacities. These basic cognitive abilities include, for example, assigning prominence to certain foregrounded aspects of a conceptualization while backgrounding others, developing a shared point of view and taking different perspectives on the same topic. While some Cognitive Linguists think the story ends here, I share the view that we need empirical and psychological work as well as evolutionary considerations to spell out in more detail what these grounding cognitive capacities look like, how they work and how they support language (cf. e.g. Gonzáles-Márquzez et al. 2007). Because from the perspective of Cognitive Linguistics, these are some of the most important questions that need to be addressed in tackling the evolution of language and cognition.